According to a hard-hitting new report, millions of tonnes of fish are being harvested from the wild every year to produce fishmeal and fish oil (FMFO) - key ingredients of farmed fish feeds - threatening food security and risking a collapse of marine life. “Until the seas run dry: how industrial aquaculture is plundering the oceans”, published by the Changing Markets Foundation and Compassion in World Farming, reviews the latest scientific research on the impact of reduction fisheries (where wild fish are turned into FMFO), and the lack of transparency and sustainability in the aquafeed sector. It highlights that major aquafeed producers, including Cargill Aqua Nutrition, Skretting, Mowi (formerly Marine Harvest) and Biomar, source raw materials from West African and Latin American countries, where the industry is undermining food security and the health of ecosystems through unsustainable fishing practices and polluting fishmeal factories. The report voices grave concerns about the environmental and human rights impacts of using FMFO in aquaculture feed, produced by a multi-billion euro industry, and calls for an end to this practice. In addition to its detrimental impact on food security and the marine environment, the practice is driving overfishing, illegal fishing and human rights abuses in wild fishery operations. In recent years, up to 45 fishmeal factories have been built along the West African coast, from Senegal to Mauritania. Many of these are Chinese-owned, processing pelagic fish into fishmeal. Highly polluting, their presence has sparked local protests leading to the closure of some plants. Additionally, intense exploitation of marine resources in the region has resulted in over 50% of fishing resources being overfished while the United Nations Food and Agriculture Organisation (FAO) has recommended the reduction of sardinella fishing in the region. In Peru, where the biggest single species reduction fishery is located, a recent report revealed that every year around 150,000 tonnes of Peruvian anchovy, intended for direct human consumption, are used for the illegal production of fishmeal. This is happening at a time when the country is grappling with malnutrition affecting children and vulnerable communities in particular. Aquaculture is the world’s fastest growing food production sector, and the FAO projects it will provide 60% of the world’s fish consumption by 2030, growing significantly from its current share of just over 50%. Paradoxically, the industry is heavily reliant on wild-caught fish with over 69% of fishmeal and 75% of fish oil production used to feed farmed fish. The global fishmeal market was worth approximately US$6 billion (€5.3 billion) in 2017 and is forecast to reach US$10 billion (€8.9 billion) by 2027. “When considering the negative consequences of using wild-caught fish for FMFO, we must not overlook the huge impact that these industries have on animal welfare. As industrial aquaculture grows, the number of animals suffering in these intensive farming systems multiplies and brings in another hidden layer,” says Dr Krzysztof Wojtas, Head of Fish Policy at Compassion in World Farming. “Most people are not aware of the additional suffering of hundreds of billions of small fish that die horribly on huge industrial fishing vessels in order to fuel these underwater factory farms. The industry must urgently address this crisis". The aquaculture industry is depleting keystone species and causing environmental problems by fishing further down the food chain. 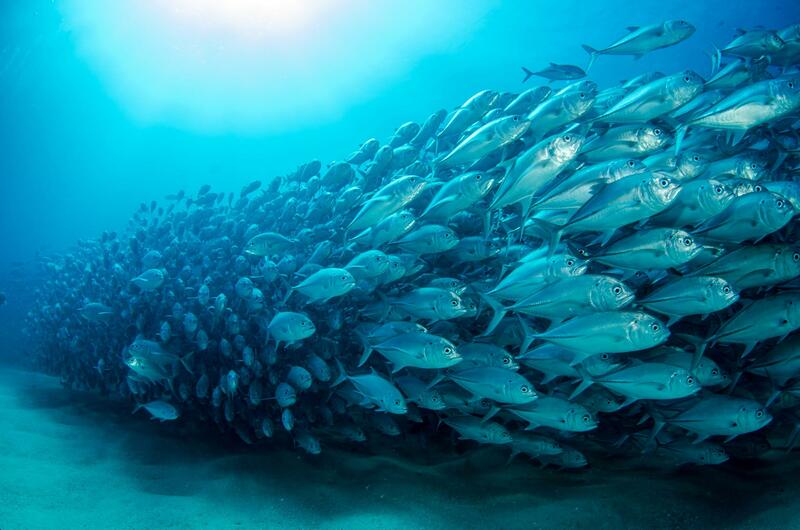 FMFO used in aquafeed uses small forage fish (including sardines, anchovies, mackerel andherring) and crustaceans (mainly krill) which constitute a critical link in marine foodwebs. Almost 70% of landed forage fish are processed into FMFO, representing roughly 20% of the world’s total catch of wild fish. Forage fisheries are impacting the food security and livelihoods of vulnerable coastal communities. 90% of fish used in FMFO could be used directly for human consumption, as it comes from food grade or prime food grade fish. The impact of these fisheries on food security in West Africa and Southeast Asia is a particular cause for concern. Producing FMFO for farmed fish is unsustainable and claims of improving environmental credentials are not warranted. Despite commitments to reduce reliance on fish protein and increase sustainability and transparency, fishmeal producers and major aquafeed companies disclose little information about the origin, quantity or sustainability of wild-caught fish. Only three out of 15 of the world’s largest aquafeed producers contacted by the authors submitted responses about their sourcing policies and practices. Catching vast quantities of wild fish for FMFO adds to the animal welfare crisis 1 Statista (2019) Fishmeal forecasted market value worldwide from 2017 to 2027 (in billion U.S. dollars). Annually, 52 million tonnes of fish are produced worldwide in intensive aquaculture systems. The widespread use of FMFO in aquaculture adds a hidden layer to the animal welfare crisis; the 0.5–1 trillion forage fish (approximately) caught each year are sentient animals killed by cruel methods only to be reduced to ingredients to feed factory farmed animals – mainly fish, but also pigs and chickens. The UK is the biggest producer (and consumer) of farmed salmon in the EU. UK salmon production covers 90% of the EU total in volume terms 2 while it accounts for almost a third (30%) of household consumption of fresh salmon in the EU in volume terms, representing spending of €860 million in 2017. Scotland dominates the production of Atlantic salmon in the UK aquaculture sector, in tonnage and value. Scotland is also home to a number of aquafeed processing plants owned by multinational companies featured in the report including EWOS/Cargill Aqua Nutrition and MOWI (Marine Harvest) which is set to open a new £93 million plant this year. 4 The Scottish Government’s growth strategy is to double the economic contribution of the aquaculture sector from £1.8 billion in 2016, to £3.6 billion by 2030. Aquafeed companies stop using wild-caught fish and switch to genuinely sustainable alternatives that do not give rise to further ecological problems. Aquaculture companies (fish and seafood farms) cultivate more species that do not require feed, require fewer inputs or can be fed an entirely vegetarian diet. Certification schemes (including Marine Stewardship Council) stop certifying fish that is not used for direct human consumption, while aquaculture schemes (such as the Aquaculture Stewardship Council) should only certify farmed fish not reliant on the use of wild-caught fish. Policy-makers strengthen governance frameworks to eliminate Illegal, Unreported and Unregulated (IUU) fishing and slave labour in global fisheries, prevent overfishing and enhance transparency and reporting throughout the aquaculture supply chain. In addition, stop subsidising aquaculture that relies on wild-caught fish. Retailers commit to full supply chain transparency for farmed fish products and eliminate fish cultivated using FMFO. Consumers reduce consumption of seafood especially of carnivorous farmed species, such as salmon and shrimp.